This comprehensive lesson uses Billy Holiday's song "Strange Fruit" as a discussion point for the history of lynching in the United States. 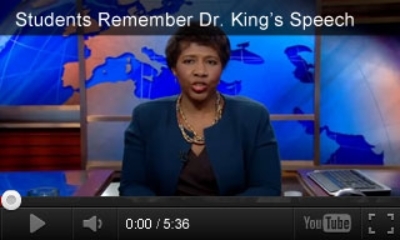 Use this lesson during Black History Month (February). Estimated Time of Completion: 3 to 5 class periods with some additional time for students to complete group projects. This lesson focuses on Billie Holiday's signature song, "Strange Fruit," a protest song Lewis Allen (Abel Meeropol) wrote in 1938 about the ongoing and intransigent problem of lynching in the American South. After asking students to assess the role music plays in their own lives, the lesson introduces some background information about lynching. The bulk of the lesson is document-based. Working in small teams, students analyze a variety of primary source materials related to lynching (news articles, letters written to or written by prominent Americans, pamphlets, broadsides, etc.) in order to assess the effectiveness of the anti-lynching campaign spearheaded by African-Americans. The documents themselves, which span 1893-1940, are a moving testament to the tragedy wrought by lynchings, as well as to the courage of those who left no stone unturned in trying to find remedies. The information each team culls from the documents is then placed on a large class timeline. Each group also creates a group of "original" primary sources which are used to decorate the timeline. Using a variety of analytical strategies, the entire class assesses the strategies of anti-lynching activists. The lesson then focuses on Billie Holiday, her song "Strange Fruit," and the role technology played in disseminating popular culture. A variety of extension activities are suggested in which students analyze the role protest music has played in more recent times (e.g. the Vietnam War era) and assess the role musicians and movie stars play in political causes in our own day. Students will learn about lynching and its relationship to racism in American history. Students will learn about the many strategies that were used to stem the tide of lynchings which engulfed the South, especially, in the first half of the 20th century. Students will use primary source documents to analyze the anti-lynching movement in America. Students will appreciate the ways in which jazz contributed to the political awareness of the American public. A copy of the PBS documentary JAZZ. This lesson primarily uses Episodes One, Two, Five and Six of the series. Materials for creating a classroom timeline, including index cards and considerable wall space, or a computer program which generates graphic organizers such as Hyperstudio or Inspiration. Materials from the Constitutional Rights Foundation on lynching and hate crimes provide useful background information for the teacher and/or students. (Again, the URL for these materials appears in the lesson). Ask students the following questions either in a discussion or on a questionnaire. How many hours a week do you think you spend listening to music? How much time do you spend making music yourself? How much time do you spend hearing live music? Of the recorded music you listen to, what types of machines and technology do you use to listen to it? How might this compare to how your grandparents listened to music in their youth? (No portable equipment, no CD's etc.) What inventions of the 20th century most affected the listening public? If none of these technologies were available to you, how do you think your life would be different? Who are the recording artists you like and listen to the most? Have any of these artists made you aware of a problem or issue in our society? If so, what problems or issues has the music brought to your attention? How does the song or music make you feel about the issue? What role do the lyrics play? What role does the music itself play? Can you think of a time in history when protest music was especially important (e.g. the Vietnam War era)? What issues was the music designed to address? Can you think a recording artist you know who has been considered "daring" for bringing a social issue to public attention via his or her music? What might still be a "taboo" issue today? Elicit from students the names of several popular songs of the day. Ask for a joyful song, an angry song, etc. Choose several of these and ask students to bring in recordings to play in class. Preview the songs before you play them several days into this lesson. Now ask students what they know about the roots of all forms of popular music they listen to today. When do they think rock and roll began? Where did that music "come from"? Next, show the segment on the origins of the blues from Episode One of JAZZ. It begins approximately 22 minutes into the film with a picture of boats on the water, and ends about 36 minutes into the film. Ask students, What about the blues do you recognize in the music you listen to today? What blues artists do you know of or listen to? You may want to review the events that took place during and after Reconstruction. Why did the removal of federal troops after the election of 1877 make it easier for Southern states to deprive African-American citizens of their rights? Why did this period see a rise in the Ku Klux Klan and the lynchings of African-Americans? What made freedmen, although "free," want to sing the blues? Tell students that they are going to learn about lynching in relation to one of the most famous recordings in jazz history, Billie Holiday's Strange Fruit (1938). Introduce lynching by showing a segment from Episode Two. It begins approximately 31 minutes into the video with a scene of the KKK marching, and ends four minutes later with a blackout, followed by flappers dancing. Ask students what they think "lynching" means. Then ask students to look up the terms "lynch" and "lynch law" in the dictionary. According to Webster's Collegiate Dictionary, "to lynch" means to put to death (usually by hanging) by mob action without due process of the law or legal sanction. The term was coined in the 1830s after a vigilante, William Lynch. Explain to students that throughout American history, many types of people have been lynched, from outlaws in the American West to immigrants in American cities, but that the vast majority of lynching victims have been African-American men. What might motivate a mob to lynch someone? What is the relationship of lynching to scapegoating? Why do you think the lynching of African-American men began primarily after the end of Reconstruction, when federal troops were withdrawn from the South? When, if ever, might a lynching be justified? An article and teaching activities about lynching and hate crimes can be found at the Constitutional Rights Foundation Web site at At the Hands of Persons Unknown: Lynching in America. According to the Constitutional Rights Foundation, between 1882 and 1968, mobs lynched 4,743 persons in the United States, over 70 percent of them African-Americans. Lynching peaked after the end of Reconstruction when federal troops were removed from the South. In 1892, vigilantes lynched 71 whites and 155 blacks. After that the number of lynchings decreased nationwide, but increasingly, lynching became a crime of the South. By the late 1920s, 95 percent of U.S. lynchings occurred in the South. The white mobs who lynched African-American men often justified their actions as a defense of "white womanhood;" the usual reason given for lynching black men was that they had raped white women. But early on, journalists like Ida B. Wells (1862-1931) saw through this sham and proclaimed that the lynch mobs' real motive was the determination to keep African-American men economically depressed and politically disenfranchised. Ida B.Wells (a.k.a. Ida Wells-Barnett) headed the Anti-Lynching League and was a member of the Committee of Forty which led to the founding of the National Association for the Advancement of Colored People. While the Constitution leaves law enforcement up to the states, a movement spearheaded by the NAACP sought to pass anti-lynching laws at the federal level, since Southern state governments appeared ineffective in fighting this crime. During the Great Depression, when Billie Holiday recorded "Strange Fruit," lynchings of African-Americans were again on the increase. Although a law at the federal level was consistently blocked by Southern senators, lynchings virtually disappeared by 1950. In part this can be attributed to improved economic conditions and the success of the anti-lynching campaign spearheaded by the NAACP. Tell students that they are going to study the history of lynching from 1893 to 1938, when Billie Holiday recorded her song. Students will place the information they gather from the documents on a class timeline along with a group of original "documents" the class creates. Assign four or five students to create the timeline itself. It can be as simple as a string posted on a long wall with dates tacked on to it. It should begin in 1890 and end in 1940. Students should allow a minimum of one inch per year (a 50" timeline) but aim for double that if there is room to post it. Alternatively, students might use various computer programs such as HyperStudio or Inspiration to generate a timeline or graphic organizer. Fill in the appropriate Document Analysis Worksheet from the National Archives. Write one index card per document for the timeline. Summarize the facts of the situation (who, what, when, where and why) and highlight any tragic dimensions of the case. Include information about anyone who tried to prevent the lynching in question, and if so, report on whether or not this person was successful. Recount whether anyone who perpetrated the lynching was brought to justice. Include a summary about the trends reported on in the article. Give some specific numerical facts (how many lynchings, when and where) and comment on their significance. Recount who created this analysis and for what purpose. In addition, students should create separate cards for each date for which there is a statistic about lynchings (e.g. "In 1892 155 blacks were lynched"). Report on the strategy used. Report on who proposed and/or implemented the strategy. Report on how successful the strategy has been to date. When teams have completed steps 1 and 2 ask groups to hold a discussion about the documents they reviewed. What forms of protest or social action did they encounter? Of these, which do they think would have been the most effective in the fight against lynch law? A letter from a family member of the lynched person describing their reaction to the tragedy. A letter to the editor of the newspaper suggesting a specific remedy to the lynching problem. A call by a political action group (such as the NAACP) for some kind of political action. A letter, speech or address about the lynching delivered by a prominent American. A visual protest, such as a poster. When the timeline is posted and all teams have completed their analysis sheets, index cards and facsimile documents, reconvene the entire class. Then distribute the Fight Against Lynching Summary Sheet. Tell students that it is now time to post all the index cards on the timeline (in chronological sequence) and analyze them. Start with 1893 and ask if any team has an index card for that date. If so, a team member should come up, read the index card out loud and post it on the chart. If more than one team has a card for that date, place the cards in vertical rows above that date. Continue for all dates through 1940. When you have reached 1940, ask one member from each team to come up and post their team's facsimile documents around the timeline. The Fight Against Lynching Summary Sheet can be used in a number of ways. You can use the questions to guide a discussion as students affix their index cards to the timeline, or after students finish posting all their information. You can ask students (instead or in addition) to write essays which address these questions, or to create visual charts which analyze them. The documents in this activity were accessed through the National Archives and the Library of Congress.
" A Terrible Blot on American Civilization" Broadside, 1922 from the Library of Congress.
" Setback for Anti-Lynch Movement," Cleveland Gazette, 1893. Accessed through the Library of Congress.
" A Protest Against the Burning and Lynching of Negroes" by Booker T. Washington, 1904 accessed from the Library of Congress.
" 'AutoDrag' is the Latest Fad of South's Lynchers" 1920 from The African-American Experience in Ohio accessed through the Library of Congress.
" Race Protests Lynching to President Wilson" 1918 from the African-American Experience in Ohio accessed through the Library of Congress.
" 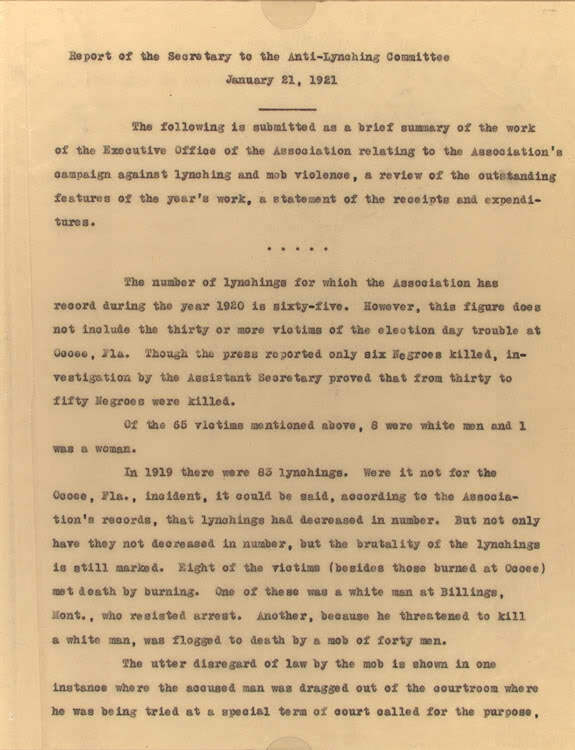 Report of the Secretary to the Anti-Lynching Committee" NAACP 1921 accessed through the Library of Congress.
" 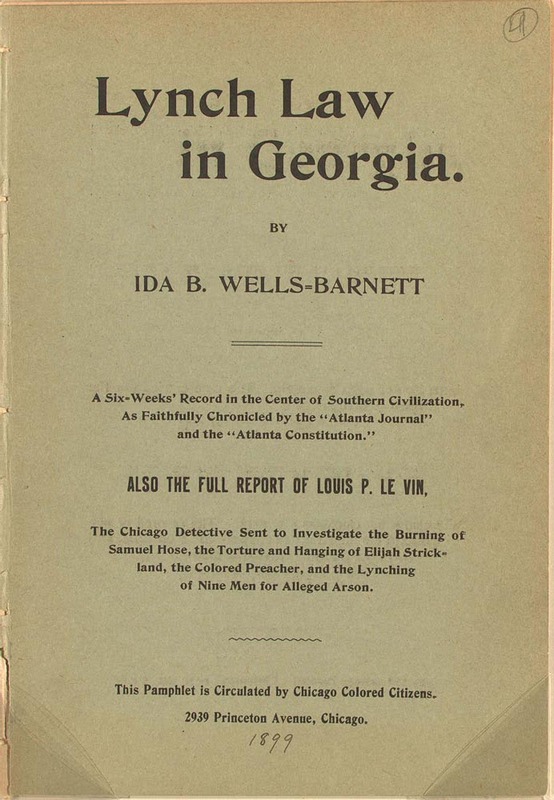 Lynch Law in Georgia" by Ida B. Wells-Barnett, 1899 accessed through the Library of Congress.
" A $5,000 Lynching" 1901 from The African-American Experience in Ohio accessed through the Library of Congress.
" Anti Lynching Law Again in Congress" Cleveland Advocate, 1920 accessed through the Library of Congress.
" Stringent Against Lynching" 1903 from the African-American Experience in Ohio accessed through the Library of Congress.
" Another Great Victory" 1901 from the African-American Experience in Ohio accessed through the Library of Congress.
" Federal Law for Lynchers" 1919 from the African-American Experience in Ohio accessed through the Library of Congress.
" Anti-Lynch Society Forms in London, England" 1894 from the African-American Experience in Ohio accessed through the Library of Congress.
" Lynchings for 1922" from the African-American Experience in Ohio accessed through the Library of Congress.
" Does Lynching Protect Womanhood: No Say White Louisiana Women" 1923 from the African-American Experience in Ohio accessed through the Library of Congress.
" National Lynching Conference" 1919 from the African-American Experience in Ohio accessed through the Library of Congress.
" 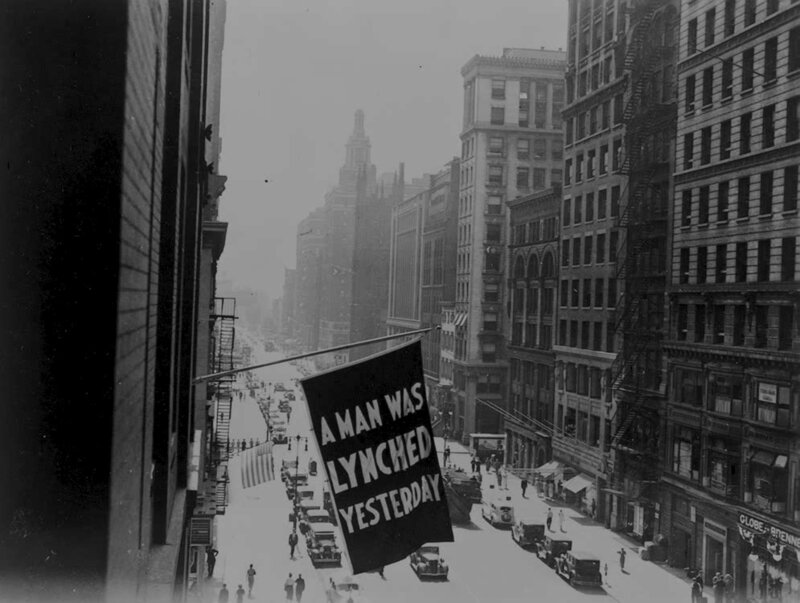 A Man Was Lynched Yesterday" flag flying from the offices of the NAACP, New York City 1938 accessed from the Library of Congress.
" Lynch Law" 1896: A resolution introduced at the Republican National Convention from the African-American Experience in Ohio accessed through the Library of Congress.
" South Carolina Arrests White Lynchers" 1916 from the African-American Experience in Ohio accessed through the Library of Congress. Activity 5: Can a Song Be an Effective Form of Protest, and If So Why? Given the enormous effort made by so many segments of society to stem the tide of lynchings, what impact could a song make and why? Pose this question to students and discuss it for a while. Now ask students to consider how music was disseminated via new technologies at just the same period of time that jazz burst on the scene. Assign one team to make index cards for significant new technologies that helped to disseminate jazz and add these to the class timeline. Jazz musicians were among the greatest celebrities of the 1930s. To convey how popular they were you may wish to show a segment from Episode Five, the segment that begins with the title "Like Taking A Drug." It starts approximately 53 minutes into the film and ends at approximately 5 minutes later. List some of these technologies on the board and discuss which had the power to convey music to the largest audience at the least expense. When did these technologies arrive in relation to the recording of "Strange Fruit"? Show the sequence from Episode Four of JAZZ in which Billie Holiday sings "Strange Fruit." It appears approximately 119 minutes into the video and begins with the title on the screen "Strange Fruit." Ask students how this song makes them feel and ask them to generate a list of adjectives that express their feelings. List these on the board. Why were most lynching victims hung from trees? Would they have died this way had they been convicted of a crime in a court of law? What kinds of fruit do trees usually bear? Ask students to generate the cycle a fruit-bearing tree would go through in the course of a season: the tree blossoms, the fruit begins to grow, ripens, and falls to the ground as perhaps the wind blows. On the ground it might be eaten by crows, etc. How do we know from the lyrics that the "strange" fruit here means the bodies of lynching victims? Why is it that Southern trees bear the "strange fruit"? What contrast is made between the "gallant South" and the South which bears strange fruit? What is ironic about this contrast? Why do you think the word "lynching" never appears in the song? Now play several of the songs students brought in to illustrate how music conveys emotion. Ask students to analyze what about the music conveys feelings, such as the rhythm, harmonies, instrumentation, tempo, and/or vocal style of the singers. Ask students what is "blue" about "Strange Fruit." How does the blue feeling in this song make you feel? Earlier in Episode Five a commentator said that Billie's songs were usually blue, but still ebullient. Is there anything joyous about this song? What qualities of Holiday's voice convey her life experiences? In what ways was Holiday herself the victim of racism? How does the song turn her into an activist? How do you think her life experiences enhance her singing of "Strange Fruit"? Ask the class to generate a list of several singers living today. Among these artists, who would students choose to sing "Strange Fruit" today and why? Why do you think she, of all jazz artists, undertook the creation of this song? What artists today connect their personal lives to songs they write and/or sing? Do students think personal experience enhances songs? Students may be assessed for the work they placed on the timeline, such as their index cards and facsimile documents. Students may be assessed on any concluding essay or graphic organizer you may assign which summarizes what the class learned through generating the timeline. Students may be self-, peer-, or teacher-evaluated for their effectiveness as members of a team, and for their contributions to class discussion. At the time Billie Holiday was ready to record "Strange Fruit" her record company thought the song was too controversial to release. It was eventually put out by the Commodore label.It was an immediate success and to this day it remains Holiday's most famous song. Ask students to discuss whether or not the song might have had an impact on racism in the '30s. Do students think social scientists or historians can gauge the effects of a song on the public, and if so how? To extend this idea, ask students to interview an adult who lived through the Civil Rights or the Vietnam War eras. What music does the adult associate with those times? What feelings and associations does that music evoke? Did the music "move" the interviewee to new awareness of a problem or into social action? What impact do students feel rap music makes on our society today? Why does it remain controversial? The Constitutional Rights Foundation writes that Hate crimes, motivated by race, color, creed, religion or gender are on the rise around the world, including the United States where over half of such crimes are committed by people under the age of 21 [but] the line between punishing hate and protecting speech and free thought can be difficult to draw." What do students feel should be done about crimes motivated by hate? Should they be treated differently from crimes motivated by other emotions, like greed, and if so why? What are proper punishments for hate crimes, such as the murder of the gay student Matthew Shepard in Wyoming in 1998? How are these crimes similar to lynchings and how are they different? Hold a debate about what should be done about hate crimes. Ask students to write a poem about an issue they care about and set it to music. Students can look at the Jazz Lounge (http://www.pbs.org/jazz/lounge/) section of the PBS Web site for help in music theory. They can pattern their song on "Strange Fruit": three stanzas with an AABB CCDD EEFF rhyme scheme. If Billie Holiday were alive today, what kinds of questions would students want to ask her about her life, singing and politics? For further information about Billie Holiday's life, view Episode Six beginning approximately 47 minutes into the video with the title "Musical Kinship" and ending about five minutes later. It is about the collaboration of Lester Young and Billie Holiday. Episode Seven has a short but moving account of Holiday's personal problems and struggle against racism. It begins about 111 minutes into the video and ends about five minutes later. Finally, Episode Nine deals with the last years of Holiday's life and her final collaborative effort with Lester Young. It begins approximately 101 minutes into the film with a jam session and ends about 12 minutes later with the title "Inside Out." Explain the rising racial conflict in different areas including the rise of lynching in the South. Analyze the arguments and methods by which various minority groups sought to acquire equal rights and opportunities guaranteed in the nation's charter documents. Analyze how radio, movies, newspapers, and popular magazines created mass culture.